Keep your eye on what you are timing: your screen will stay awake as long as TapWatch is active and a timer is running. Time comfortably: the whole screen is a button so you do not need to cramp your finger up trying to hover it over the screen. Check progress with a glance: the timer is big, high contrast, and alone on the screen, allowing you to check the elapsed time or the time on your current lap with a glance. While running laps, the total time and your four previous laps are also tastefully displayed in smaller text. 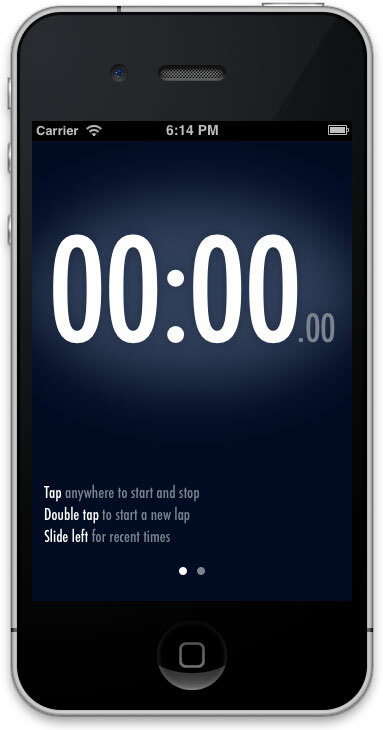 Multitask: start a timer in TapWatch and hit the home button. Even if iOS completely shuts down TapWatch, your current timer will still be running when you relaunch it. Compare recent times: TapWatch automatically saves your 50 most recent times, which you can view at any time by sliding the screen to the left. Scales wonderfully: time anything, whether it lasts tenths of a second or hours. Optimized for iPhone and iPad: buy once and use it on all your iOS devices (some styling disabled on iPad retina for performance reasons).